He did exactly what he said he was going to do. He was timely, he treated his workers well, he supervised well, and we were really happy with the job. The way he treated his employees really impressed me and his price was very fair. I just recommended Steve to one of my neighbors. He's very honest and trustworthy. I had no qualms about going out and leaving him here when I wasn't here. They're very neat, fair, and honest. He met all of our expectations for what we needed and more. If you want someone with the highest level of skill in any capacity, from throwing up a roof, to redoing a difficult carport, to the finest woodworking, he's a visionary with outstanding skill. He's honest, fair, consistent, and delightful person to be around. He's on time, competent, reliable, responsible, and he has a great team working with him. The quality of his work and his integrity, he has done major work in my home, and I'm beyond satisfied. He's like a homeowner's dream come true. 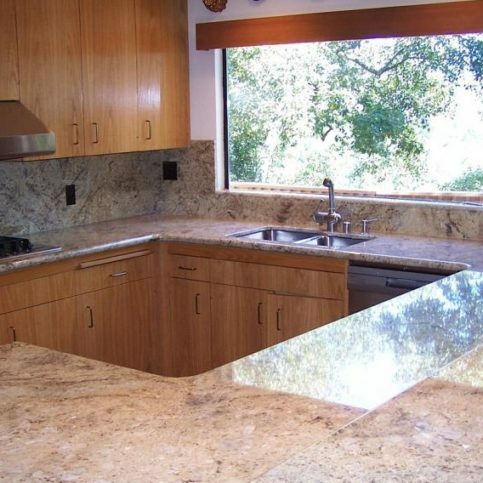 Labourdette Construction remodels kitchens and bathrooms, builds decks and patios, and provides general construction services for residential clients throughout Sonoma County and Novato. The company takes a full-service approach to construction that allows it to handle every aspect of its customers’ projects, from the initial designs to the finishing touches. 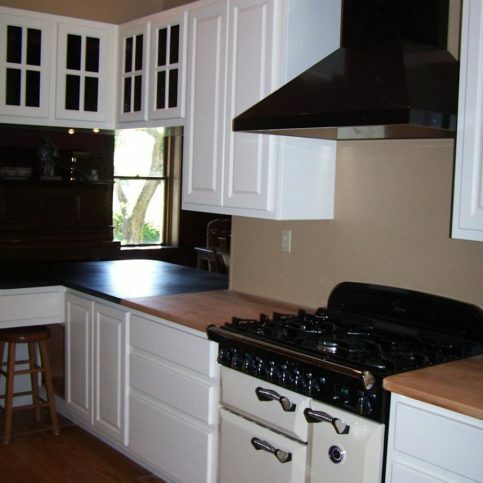 Labourdette Construction recently completed this kitchen remodeling project. 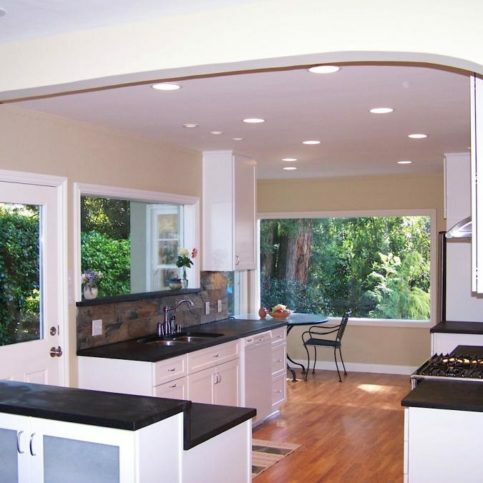 Labourdette Construction has been remodeling kitchens and bathrooms; building patios, decks and room additions; and providing general construction services for residential clients throughout Sonoma County and Novato since 1999 (Steve’s remodeling experience goes back to 1989). The company is known for its customer-oriented business practices, which include pulling permits, customizing its services to meet specific budgets, and using all its resources to focus on each client’s unique needs. To further differentiate itself from its competition, Labourdette Construction provides every project with the hands-on expertise of Mr. Labourdette himself. “I don’t just stay in the office and delegate work to my employees—I’m with them on the jobsite, overseeing every detail and taking part in the process,” he says. When taking on a remodeling project, make sure you choose the right wood. Free from the weather-related restrictions of exterior woodwork, the spectrum of wood choices for interior remodeling projects is comparatively broad. In addition to more common species such as spruce, oak, Douglas fir, redwood and pine, there are many lesser known varieties like hickory, alder and zebrawood. Since the possibilities are so vast, choosing wood can be overwhelming for homeowners who don’t have the benefit of a carpenter’s expertise. That’s why it’s a good idea to do some independent research or seek the advice of a knowledgeable contractor before choosing a type of wood for your interior remodeling project. Q: How long will my project take to complete? A: It depends on the project, but we always work as quickly and efficiently as possible. For example, we’ll order all the necessary materials in advance of your start date so we don’t get held up waiting for materials to arrive. By planning ahead and looking at your project as a whole, we’ll be able to keep to our estimated schedule and complete the job on time. Also, since we do most of the building in-house, there’s no downtime between trades. Bathrooms can take as little as one week to remodel, and kitchens can take as little as four weeks from the start of demolition. Q: Can I stay in my house during the remodel? A: Yes, and we will alleviate the discomfort and stress that can sometimes come from living in a construction zone. 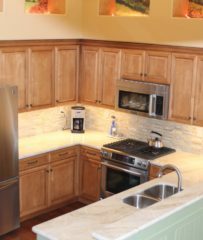 If we’re remodeling your kitchen, for example, we’ll leave the sink or oven hooked up so you can use it until we replace it. We’ll also put up plastic walls to create a dust barrier. Q: Can you help me pick out things like light fixtures and appliances? A: Certainly. This is a great way to build a team with you and give you the exact remodel you want. Once we get an idea of what you’re looking for, we’ll show you the most appropriate vendors for everything you need. We’ve been in this area for 24 years, so we know all the right places to go. Q: Do you handle the permit process? A: Yes. We have a lot of experience dealing with the various building departments throughout Sonoma County, so we know exactly what to give them and how to avoid the red tape that can delay a project and add costs. Q: Do you build room additions? A: Yes, we design and build room additions and have set per-square-foot prices for different projects. 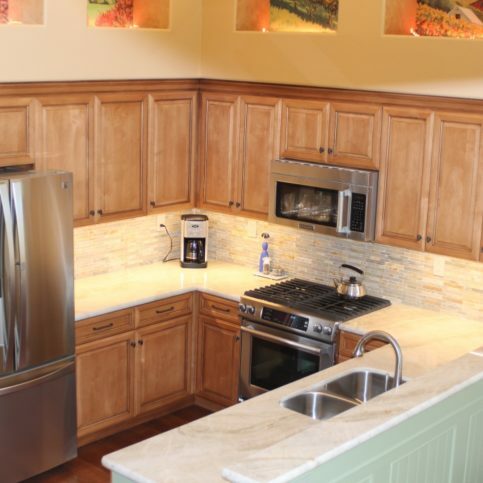 Q: Do you build custom cabinetry? A: Yes. Building custom cabinets requires a higher level of skill than doing finish carpentry around walls, doors and windows. You have to be extremely detail-oriented to build beautiful cabinets, and we apply this level of detail to every aspect of a remodel. Q: Do you provide free estimates? A: Yes, but we also like to give ballpark prices over the phone so our clients can prepare realistic budgets. 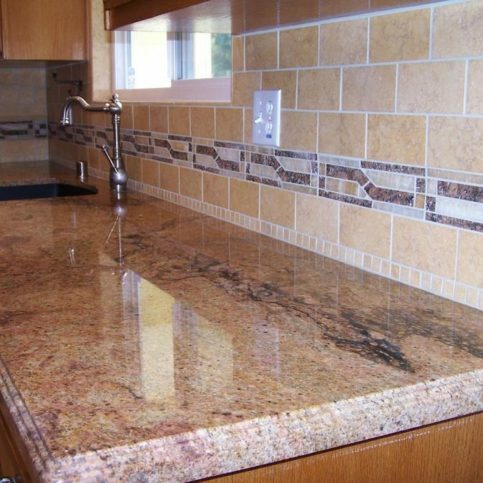 Bordeaux granite with travertine and slate backsplash. Custom white painted cabinets, tile counter and backsplash. Stained glass Anderson window with new tub and travertine floor. 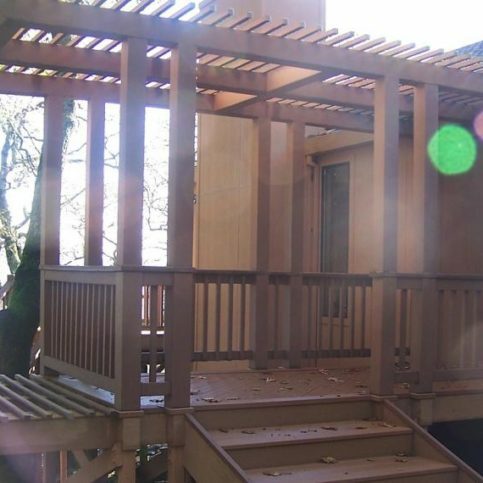 Trex Transcend deck with shade trellis. Porcelain tile shower with marble feature strip. Curved alder wood vanity cabinet with matching medicine chests. 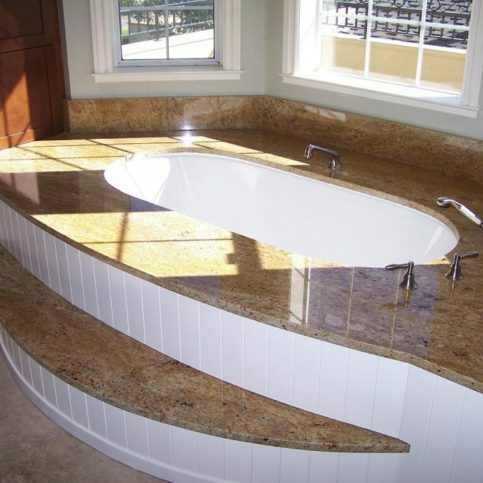 Under-mount tub, granite deck and step with poplar wainscoting. 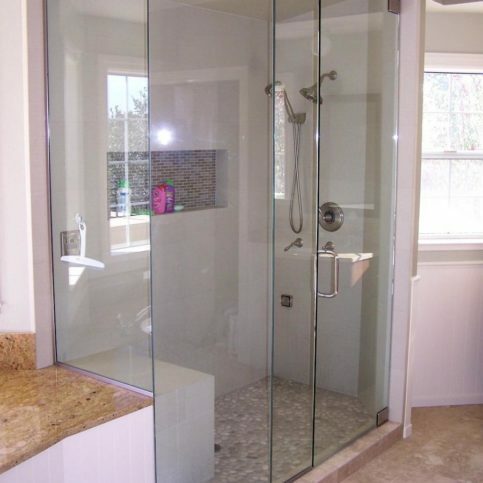 Custom 1/2" glass shower with textile shower wall tile, travertine floor. 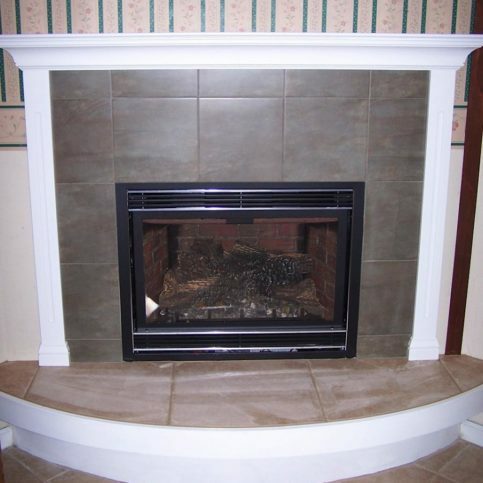 Natural gas fireplace insert with tile surround and hearth. 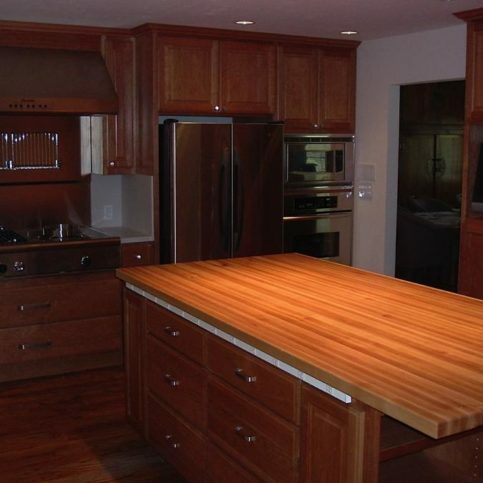 Book-matched oak veneer cabinet refacing, granite counters. 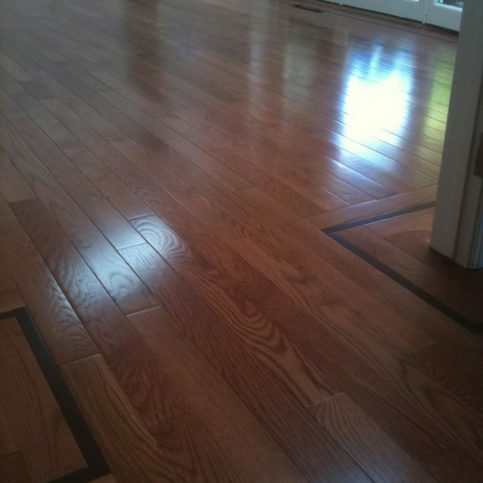 Oak floors with walnut border and satin aluminum oxide finish. 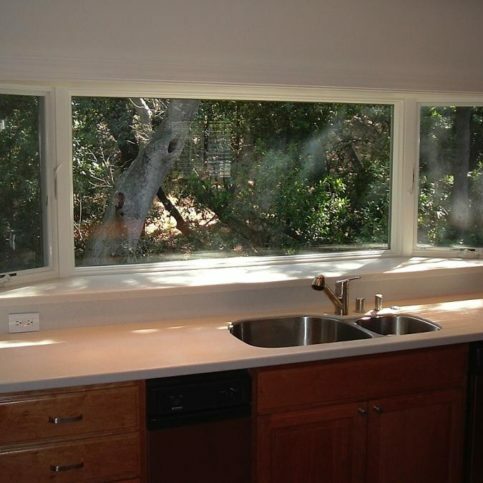 Custom cherry wood cabinets, Anderson bay window, Corian counters. 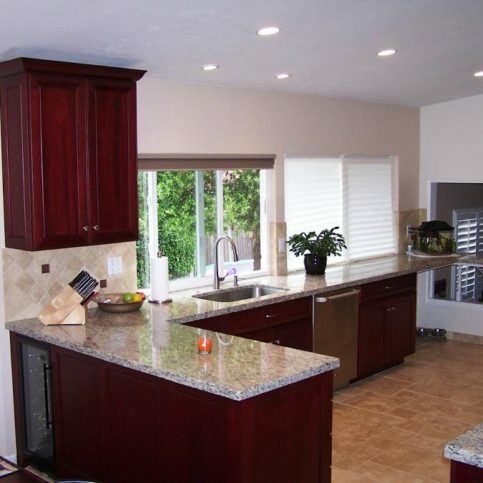 Custom cherry cabinets and maple counters with recessed lights. 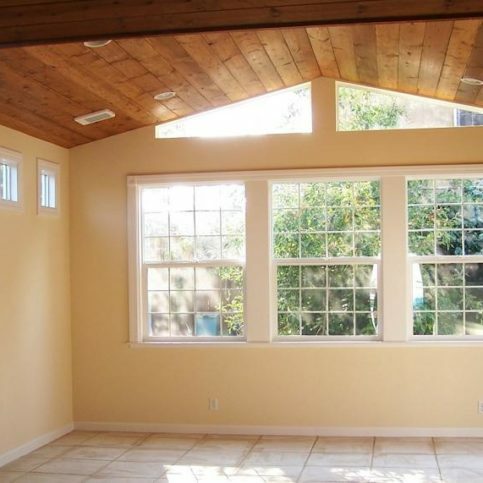 Room addition with south facing windows and custom rake windows. Trex Accents deck rail with tongue and grove composite decking. Trex Accents trellis with tongue and grove composite decking. 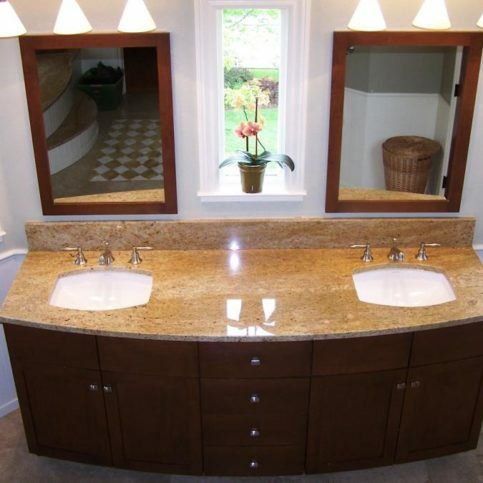 Melamine kitchen cabinets with soap stone counters. Custom painted cabinets, soap stone and maple counters. 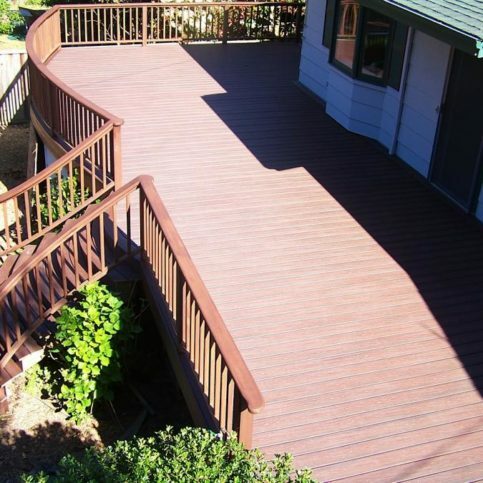 Curved Trex Transcend deck with curved redwood rail. Trex Transcend deck and rail, new rot-repaired Douglas Fir siding. 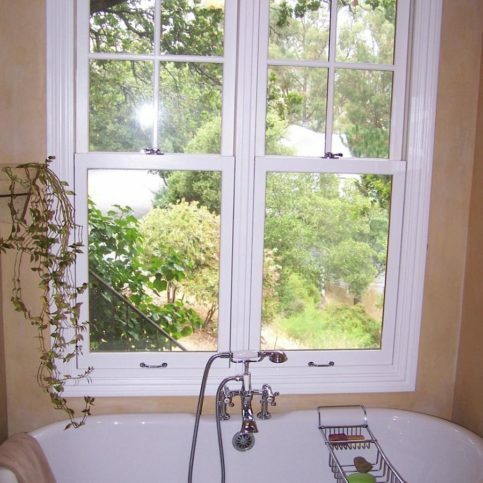 Claw foot tub with vintage fixture, Marvin window. 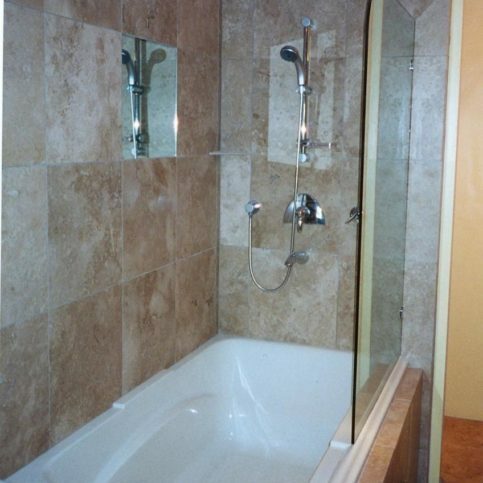 Travertine and mirror shower wall, tub skirt and deck. 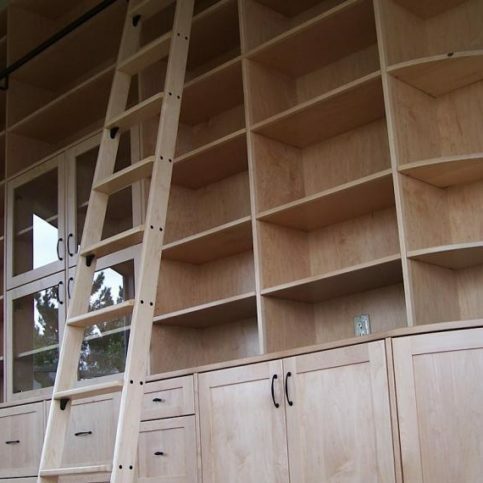 Maple library with custom ladder and curved end cabinet. 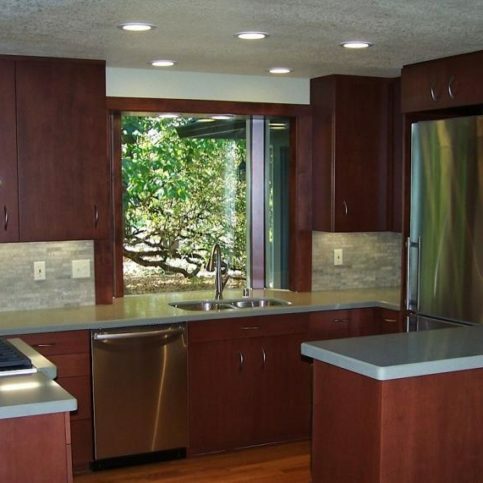 Kitchen with travertine floor, granite counters and modular cabinets. Steve Labourdette is a 28-year veteran of the construction industry and owner of Labourdette Construction, a Diamond Certified company. He can be reached at (707) 234-5963 or by email. SEBASTOPOL – When Steve Labourdette took his first remodeling job as a young man, it was simply a means to earn extra money for an upcoming trip. However, the passion he developed for his work would later blossom into a full-fledged career. “When I was 20 years old, I decided I wanted to do some traveling,” he remembers. “I’d already had some construction experience, so I was able to get a second job doing home remodels to save up some money. I found that I really had a knack for it, so when I returned after six months of traveling, I decided to get back into it. Later, I got my license and started my own company, and that’s how I got where I am today.” Since 1999, Sonoma County residents have been benefitting from Steve’s expertise as owner of Labourdette Construction. Q: What’s your favorite movie genre? A: I like all kinds of movies, but documentaries are probably my favorite. The first year we had Netflix, my wife and I watched documentaries almost exclusively, and we still watch them often. Q: Are you an early bird or a night owl? A: I could be either. Sometimes I stay up late, other times I’m up early—never back to back, though. Q: What’s your favorite season? A: Fall. I love the nice, mild weather. Q: Ever have a conversation with a famous person? A: One time at a Giants game, I found myself in an elevator with Willie Mays and ended up chatting with him for a few moments. Q: If you had a warning label, what would it say? 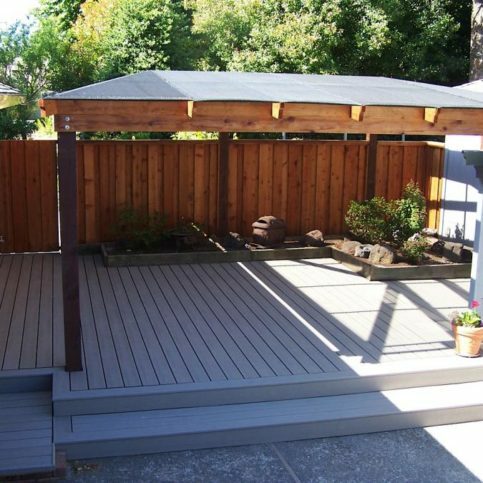 SEBASTOPOL — When installing a new deck, waterproofing is a crucial aspect of attaching it to your house. By taking thorough measures to properly waterproof your deck, you can expect it to have a longer lifespan and avoid rot issues with both the deck and your house. One of the main components of deck waterproofing is the flashing, which consists of a couple different elements. First, there’s the Z bar, which is a piece of metal in the shape of a “Z” that fits over the wooden ledger to deflect rain and moisture. Another important component is membrane flashing, which is installed under the Z bar, behind the ledger and in any area where moisture is a concern. Siding is also important when it comes to deck waterproofing. When attaching a deck to a house, cement siding works best because it provides a solid, waterproof barrier. Often, when a contractor replaces a deck, they’ll find the house has been infected with rot due to inappropriate siding installation. 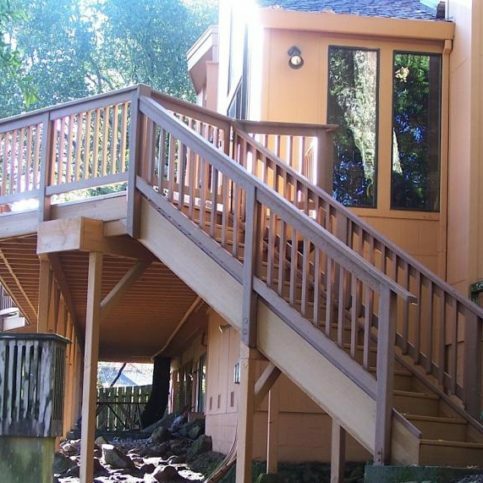 When completed, both the deck and the home will be protected by several layers of waterproofing material that include various pieces of flashing and siding. All these components work together like shingles to repel water, which will keep your deck and home safe from rot. 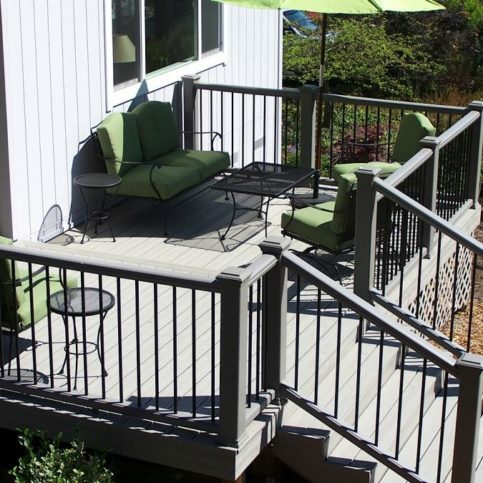 SEBASTOPOL — Host, Sarah Rutan: When remodeling your deck, its important to know about proper installation. Today we’re in Sebastopol with Diamond Certified Expert Contributor Steve Labourdette of Labourdette Construction to learn more. Diamond Certified Expert Contributor, Steve Labourdette: I’m going to show you the proper way to attach a deck to a house that will ensure years of good quality without any rot to the house or the deck and the structural way to hold the deck together well. So, one of the most important parts when you are attaching a deck to the house is the flashing. That’s this metal piece here is the flashing. This black stuff here is also the membrane flashing. This is the ledger, which ill show you in a minute, that’s the structural part of the deck and this is showing some siding which is a great siding to use for under the deck because oftentimes when you are replacing a deck, the house has been rotted because it wasn’t attached this way and you want to use a really good rot proof siding which can be underneath that deck. You never have to see it but its never going to rot because it is actually made of cement. So the flashing here as you can see goes over the metal so when that rain hits this flashing and this has whatever siding your house has over it over this and as that rain hits the siding, the stucco, whatever it is, its going to hit this flashing, then its going to hit this metal and then its going to hit this other flashing and then its going to hit the ledger. Behind the ledger, you’ve got more flashing and the siding like I discussed this cement siding. So lets take a look over at this house and I can show you how all these pieces look when they are on the house. You can see this part of a Z bar right here is also right here on the house is that part of the Z bar right there. You can see it’s on top of the ledger keeping that water off the ledger. Now on top of this metal is the rubberized flashing like I showed you which ties into the other flashing of whatever your house is protected with, hopefully protected with felt paper behind the siding of your house. Now this here is the ledger and you can see that’s been painted and that’s where the deck is structurally attached to the house. You can see the bracket here, which is also attached to the house, which we did not have in the mock up. You can see here is the cement siding behind the flashing and some more Z bar down here. So all of these steps here are like shingles in a way where one is keeping the water off of the thing that is below it and then you get all the way down to where you have your house protected from top to bottom from the rain intruding in. Labourdette Construction : Average 9.3 out of 10 based on 46 unique customer surveys of customer satisfaction. I think they do fine work. I have been satisfied. They are very straightforward and have great ideas. He is very easy to work with. He has great ideas and is terrific. 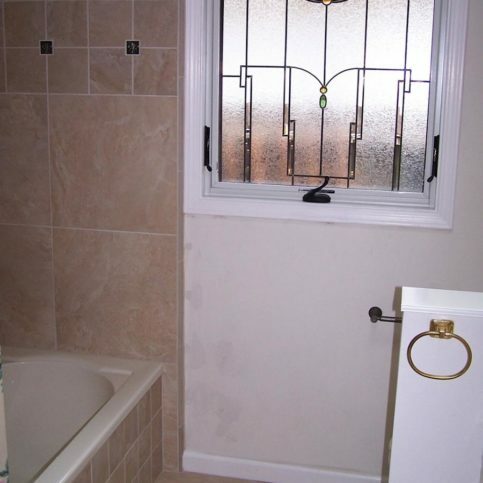 He did a great job, and I am pleased with how my bathroom turned out. He paid attention to detail and was thorough. Nothing really, it was good. They did what they said they would do, and they weren't slow. All I can say is that his work is exemplary. He is just a nice man. He's honest, and he tries to work with the client. He worked with me and gave both my husband and myself what we wanted by taking care of our house. I am so pleased with their work. He's a perfectionist. I can't say enough good things about him. He's a good man who takes pride in his work and it shows. I liked his professionalism. He showed up when he said he was going to show up, he was there when he was supposed to be there, and he did what he promised he would do. He gave us advice on what our part should be. He just takes pride in his work and it shows. I'm extremely pleased. 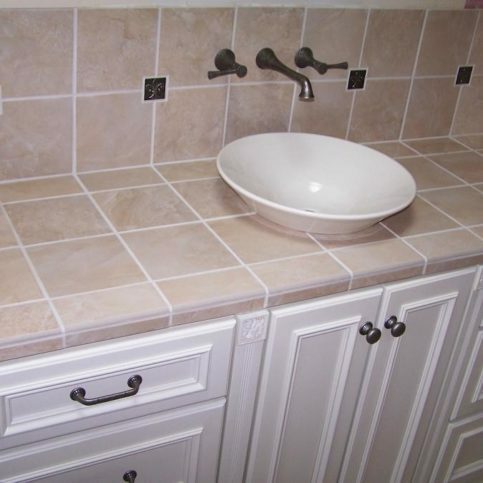 He knew our budget was not high, but we wanted our three bathrooms remodeled before the holidays, and he got everything done by Thanksgiving, even though we hired him in September. When we wanted to purchase different cabinets on our own, he installed them. He's a lovely man to have working on our house. We had every bit of confidence in him, and he most recently remodeled our family room. They're very competent. They did an extremely good job, they did it in a very professional manner, cleaned up afterwards, and explained everything as they went along. He provides quality work, he listens to what you want, and then he delivers on it. He's very easy to talk to, willing to discuss the project, and came up with ideas that worked with everybody. I think they do a good job. I've worked with contractors who are Diamond Certified, and my wife used to work for a Diamond Certified company, so we depend on Diamond Certified. I would say he's great. He did what he said he was going to do, he showed up when he said he would, and he cleaned up after himself. He's amazing. He kept me in the loop by explaining everything about the construction. He's very professional, very nice, and he does an awesome job. He was super professional and always on time. They pay attention and they have good quality. He's personable, he listens, and he's just a really nice guy. He got the work done on time, he did what we asked him to do, and we were very satisfied. I would recommend him. They're friendly, professional, and efficient. I felt comfortable having him in my house. They were very accommodating, honest, trustworthy, and they did a very good job. They're accommodating, honest, and trustworthy. Steve is honest, and he does good quality, custom work. He helped me come up with a solution with my fireplace and mirror. They do high quality construction and home additions. They have tons of experience, and they do a solid job. I liked that Steve was quick, and his quality was excellent. I have a lot of confidence in his work, and I also find him to be very personable. He's a good communicator. Steve is very responsive, respectful, and conscientious about doing what you want and what the best quality is. I had a lot of confidence and trust in Steve's expertise. 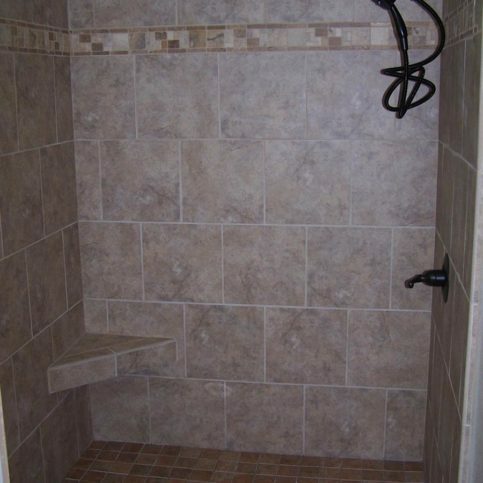 He's calm, personable, and he did a much more of a professional and thorough job than the previous contractor I used. He's honest, on time, and easy to work with. It was a very positive experience. They're easy to work with. I was very happy with them.